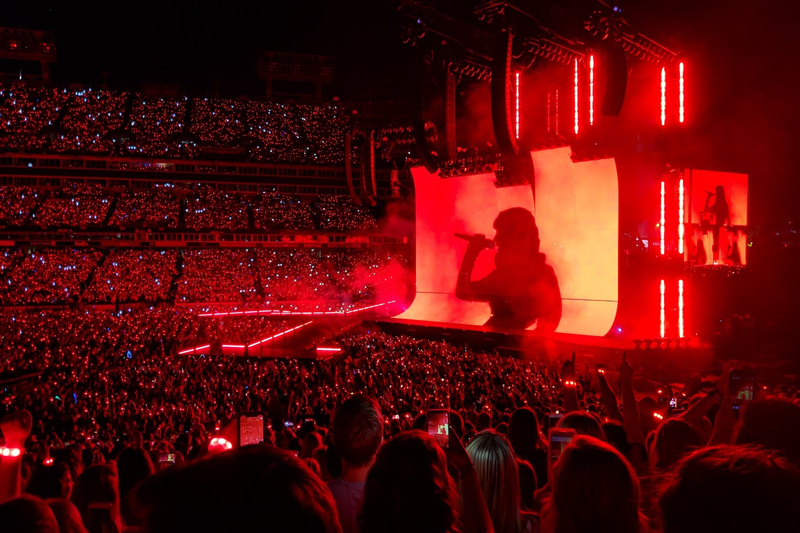 Taylor Swift brings her Reputation Stadium Tour to Nashville’s Nissan Stadium on August 25, 2018. Since 2006, Taylor Swift has been captivating listeners with songs about love stories, but the greatest one she ever wrote is the one with her fans. That bond shone in glittering glory Saturday night (Aug. 25) at Nashville’s Nissan Stadium, where about 50,000 devotees witnessed an extravaganza of dancers, fireworks, and confetti. Not to mention two killer opening acts: Camila Cabello (who has surpassed a billion streams with hits including “Havana” and “Never Be the Same”) and Charlie XCX (“Boom Clap,” “Fancy,” “I Love It”). Swift inspires an unsurpassed level of fan devotion, as evidenced by ticket prices ranging from approximately $100 to $500, and proven more importantly by the swarms of Swifties dressed for the occasion. Fans of all ages turned out in T-shirts sporting song lyrics or pictures of her famous felines, carrying signs, or wearing stuffed snakes wrapped around their necks. In fact, their gorgeous outfits of devotion could only be outdone by Swift herself, who dazzled all night with numerous intricate, sequined costumes. 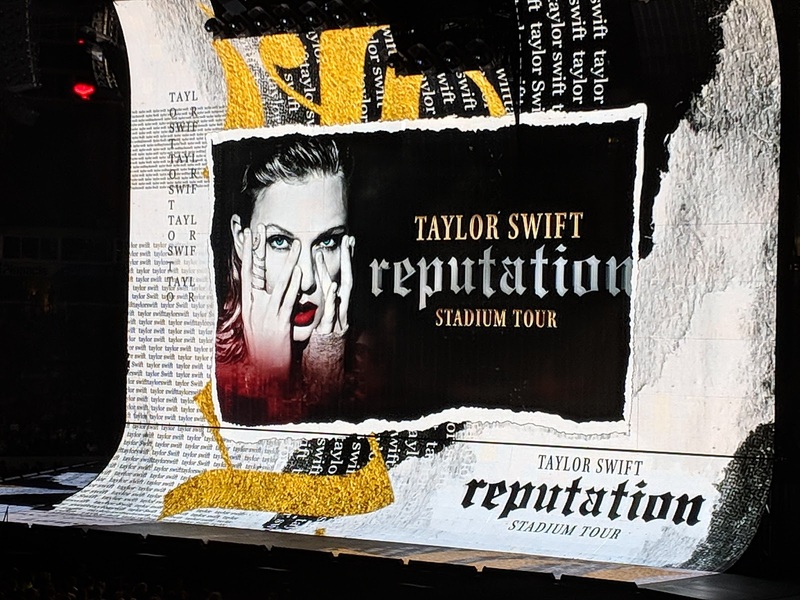 Elaborate production is a highlight of Swift’s Reputation Stadium Tour. 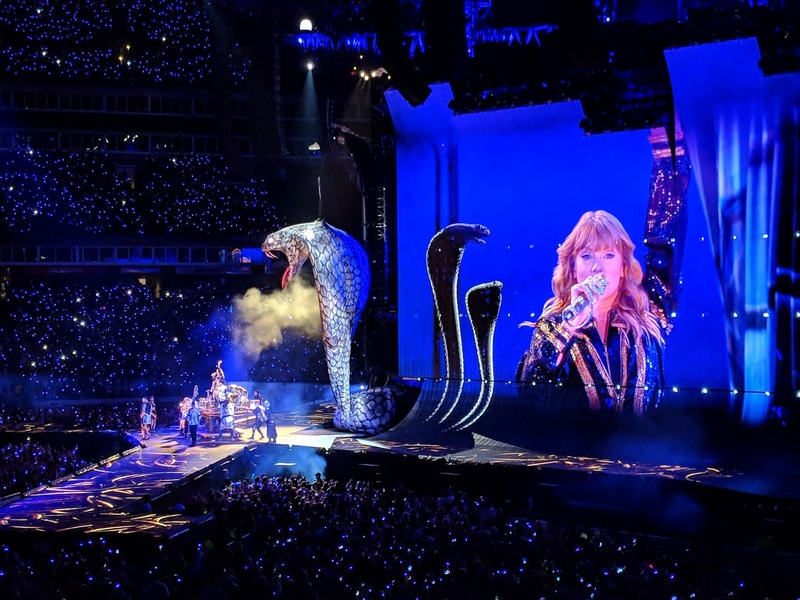 Snake imagery is integral to Swift’s Reputation album and tour, alluding to her public feud with Kanye West and negative jabs from online naysayers. In true Taylor fashion, she let fans in on her side of the narrative through her music, ultimately turning it into one of her greatest creative triumphs. 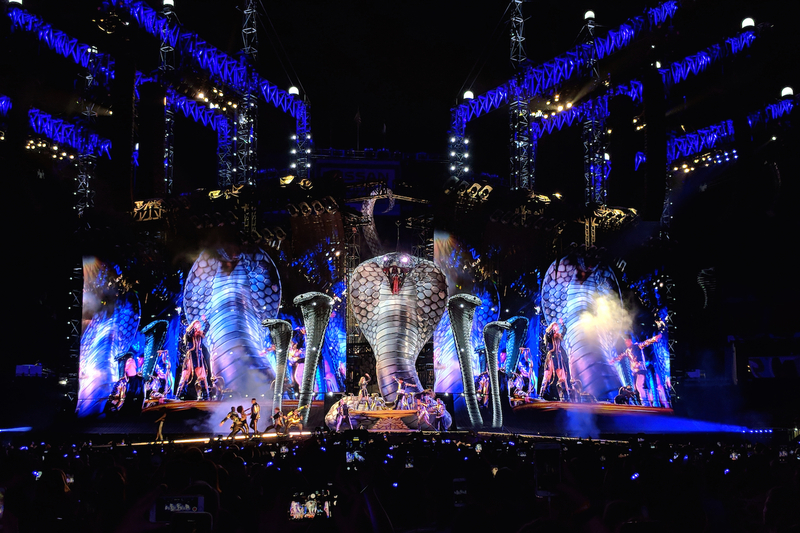 The tour’s serpentile frenzy features huge inflatables, videos, a snake microphone and snake skeleton cage carrying her high above the crowd. 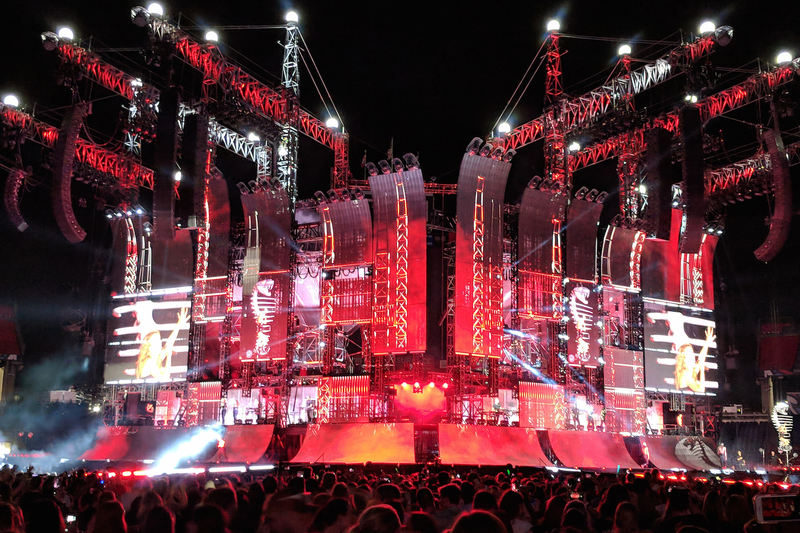 The Reputation tour is a showcase of today’s production capabilities. The concert opened with black and white video flashbacks from the beginning of Swift’s career, with voiceovers of more recent negative media commentary. From the first song, “…Ready For It,” Swift dropped one spectacular moment after another. Dancers dressed as samurais filled the sprawling stage while smoke spewed from the sides. Videos moved on screens of breathtaking proportions. By the second song, “I Did Something Bad,” flames were shooting into the night sky radiating enough heat to warm those seated nearby. Throughout the concert, dancers donned elaborate costumes, at one point marching onstage beating enormous drums, and later gracefully floating with wing-like arms. Giant pythons don’t scare away Swifties. The stadium was filled with waving hands wearing light-up wristbands presented to every attendee upon entering the show. The bands changed color to set the mood, emitting a soft pink glow during “Love Story,” and red during “Look What You Made Me Do.” The bands, she said, help her see every single fan. It’s all part of Swift’s tireless devotion to making each person feel like part of the show. Accordingly, she sang “You Belong With Me” as live images of the crowd appeared on the screens. At age 28, Swift is the very capable ringleader of one of the largest tours in the world. And yet there remain worthwhile glimpses of the artist who has grown up before our eyes, the singer who truly enjoys performing, soaking in the crowd’s administration like she always has. As she gazed out at the sea of fans at her “hometown show,” she recalled her first visit to the venue, attending CMA Music Festival as a young teenager with her mother. “It was incomprehensible to me [at the time] that anyone would play in that stadium,” she said. Reminiscent of previous tours, Swift glided on platforms through the air to visit smaller stages in the venue—“exploring,” she called it. At the back of the stadium, Swift briefly returned to the earliest incarnation of the superstar we know today. Alone with her guitar, she told the crowd, “I still think of myself as a songwriter first.” She said a song should be sturdy enough to strip away the production and be performed on the instrument on which it was written. Then she happily strummed “Dancing With Our Hands Tied.” She continued with “Better Man,” one of the few songs written solely by Swift which was recorded and released by another artist, Little Big Town. Back on the main stage, Swift continued to enthrall. Seated at a grand piano, she returned to her first hit, “Tim McGraw,” and welcomed surprise appearances by Tim McGraw himself and wife Faith Hill, who rose up from beneath the stage. Swift’s mega-staging was jaw-dropping for fans.